The BARUCH PADEH Medical Center, PORIYA is affiliated to the Faculty of Medicine in the Galilee - Bar Ilan University. 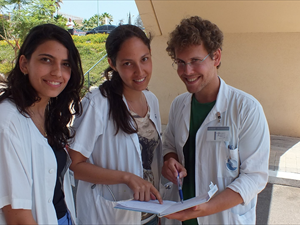 Medical students from Bar Ilan split in clinical groups of 6-8 students while studying at the medical center. During the fourth year, some of the groups come to the internal and sub internal departments (cardiology, nephrology, oncology, geriatrics, and others) at the Medical Center and Join to the staff at the departments. Students training includes: training at the patients` bedside, lectures, seminars, professional meetings including X-ray meeting, ect. The students learn to perform various operations. During the fifth and sixth year the students lern also in all other departments at the hospital: Pediatrics, Surgery, Gynecology, etc. At the end of the sixth year some of the studenrs will come for an internship at the Medical Center and thus ended their long training. 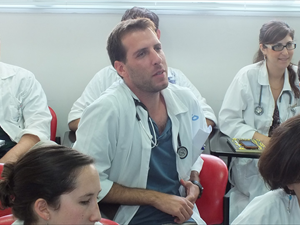 At the end of the internship, each intern decides what interests him particularly and we hope that some of them will decide to stay in the Baruch-Padeh MC and specialize here.